“The Boy Who Harnessed the Wind,” a moving tale based on the true story of William Kamkwamba, a young Malawian innovator and engineer who rose to fame in 2007 for building a wind turbine to bring electricity to his family farm during a drought. 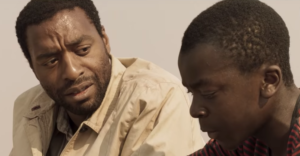 According https://www.indiewire.com, Ejiofor also stars, delivering the powerhouse performances he does best in the newly released trailer. He stars opposite newcomer Maxwell Simba, as well as Aïssa Maïga and Lily Banda. “Young William Kamkwamba (Simba) lives with his family in rural Malawi, where he attends school regularly and shows great aptitude for his studies. Yet after land development and poor weather lead to a meager harvest, famine strikes the village, alarming the community and forcing William to drop out of school when his father (Ejiofor) can no longer afford the fees. Ejiofor adapted the script from Kamkwamba’s autobiography, written with Bryan Mealer.